I love that “big picture” feeling you get from the airplane window. It’s been a long time since I have been able to get a window seat on a coast to coast USA flight in daylight to enjoy the view. 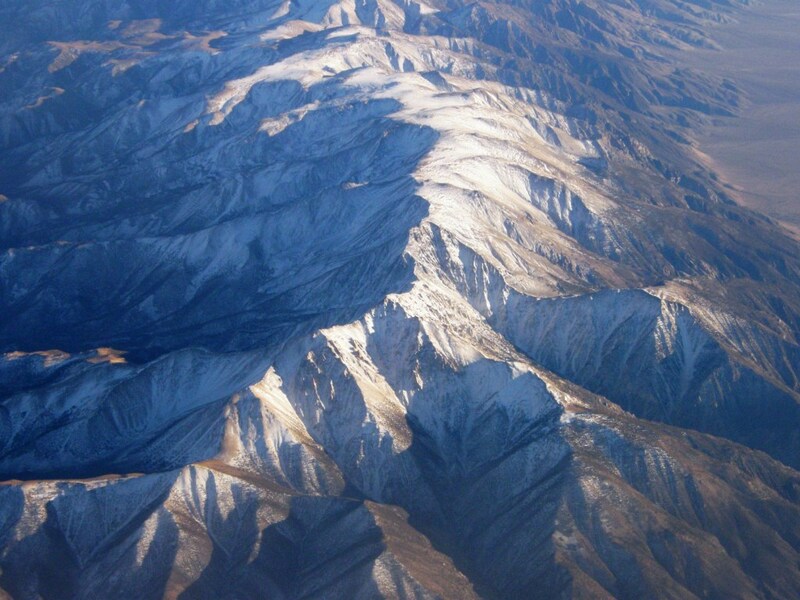 The picture below was taken somewhere between Dallas and San Francisco last week. The view reminded me of the months in the early 90s when I would be sometimes rambling about on top of the Sangre de Cristo Mountains on a peak bagging trip or dropping by rope into the depths of the Utah canyons. From the air you feel so carefree floating over the ever changing landscape like a bird while trying to imagine the thousands of specks of people down there below like ants and what they might be up to. In a similar way, I made myself step back and admire the big picture before zooming in on the details when Ute brought in a piece of Uzbek silk ikat cloth for me to examine and admire during a visit with her in Northampton. 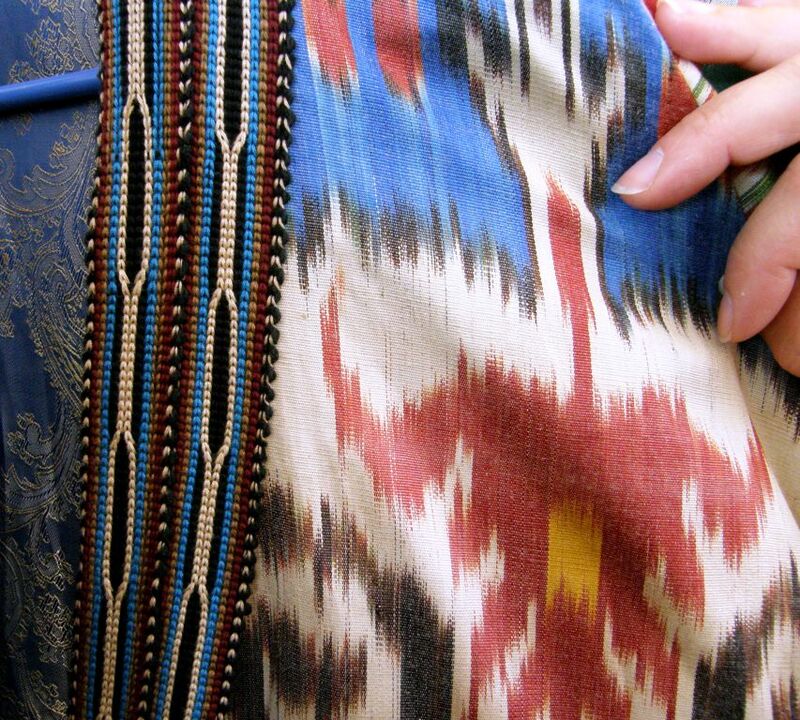 I got to see the exhibit of Uzbek ikat robes at the Textile Museum in DC a few years ago. Of course, that was a strictly “hands off” affair. And even though I had the opportunity to touch similar fabric from Uzbekistan at the International Folk Art Market in Santa Fe this year, the market simply had far too many interesting things to be able to stop and focus on any one item for any meaningful length of time. Thanks to Ute, I had time alone with the cloth at left and could examine it to my heart’s content although I found it difficult to capture its true colors on camera. I took extreme measures to keep my warp threads aligned on this piece…that was my goal at the time. 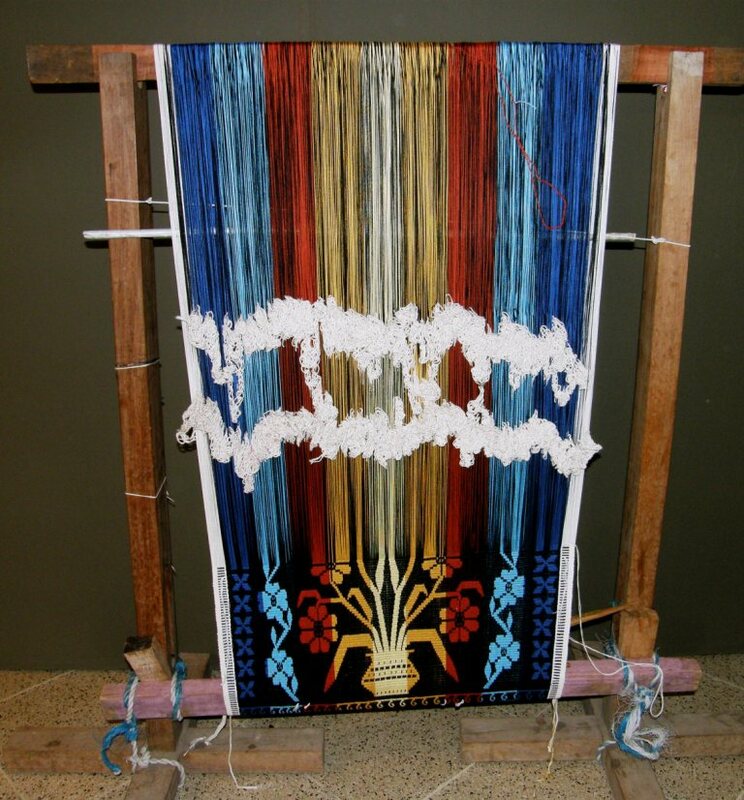 I am talking about those horizontal bars that show that the warp threads have shifted from the original positions into which they had been locked during the tying and dyeing process. 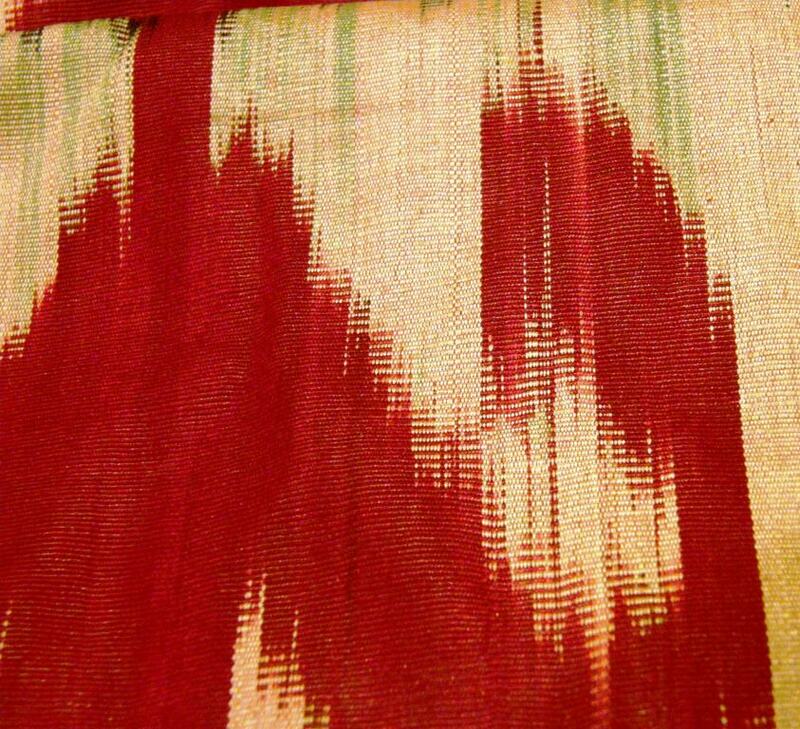 It was always so disheartening for me to be weaving and approaching with excitement the first wrapped area on my ikat warp, eagerly waiting to see how my carefully tied and dyed pattern would appear only to see first, the little specs and then the growing rows of lines of un-dyed thread appearing….those dreaded railway tracks. They told me that the threads had been displaced too much and that my design had been ruined. 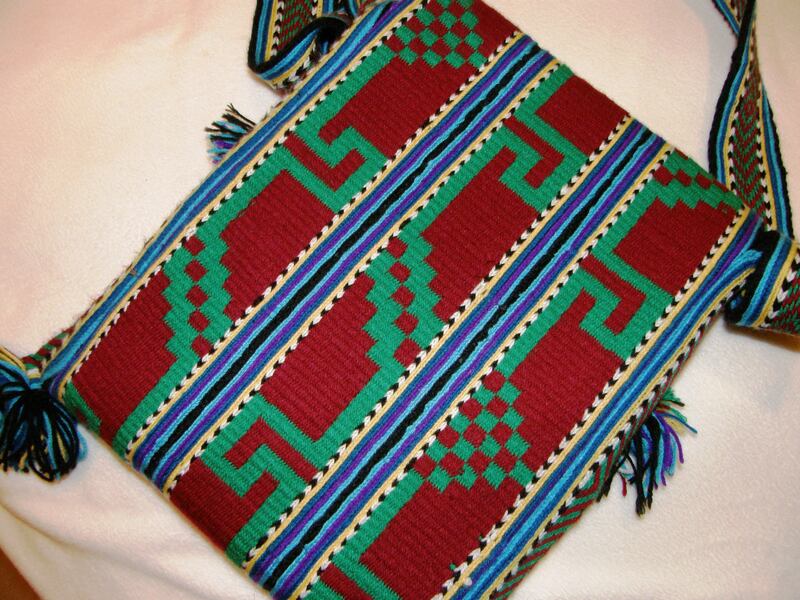 But, walk away to the other side of the room and look again at the Uzbek cloth. What do you see? 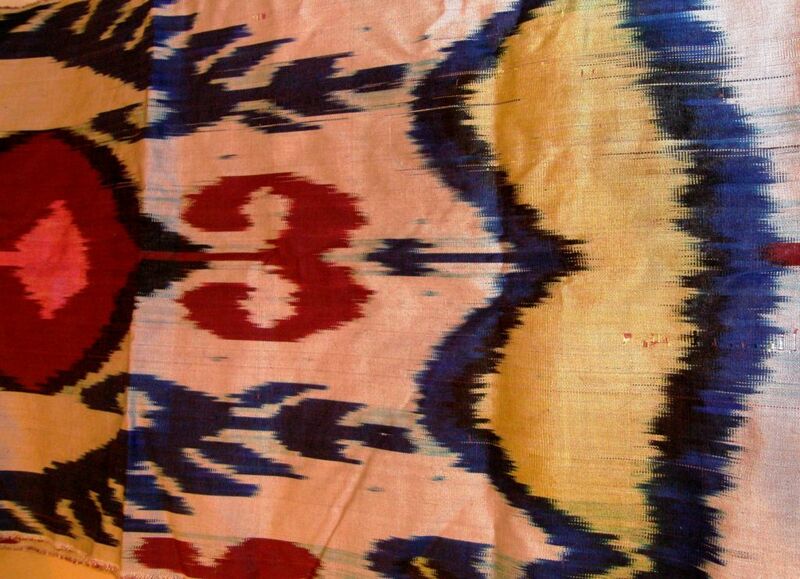 A beautiful pattern with the soft blurry outlines that give ikat its charm and character. Look at the big picture! 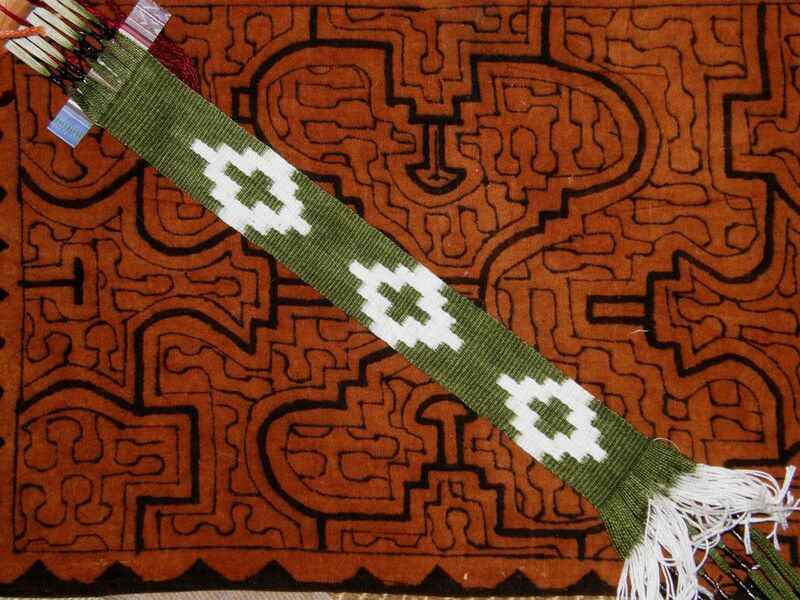 I will be trying ikat again when I get back to Bolivia and reminding myself to think like a bird and not an ant! The same goes for one of my current favorite structures as woven by the Guarani weavers of the lowlands of Bolivia…intermesh. Stand back and admire the crispness and clarity of the design woven by my teacher Angela. 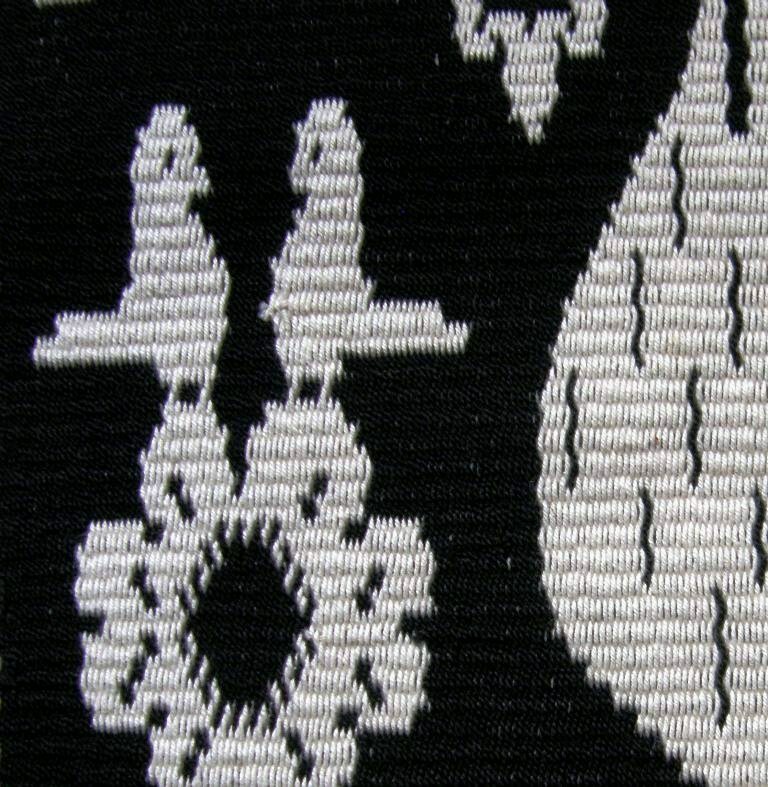 Closer inspection of motifs on another piece show the feathering that characteristically appears along the edges of diagonal lines. This has me adjusting and readjusting my pattern charts in an effort to reduce the feathering as much as possible which can sometimes distort the original shape I was striving to create. Stop fussing and thinking like an ant! 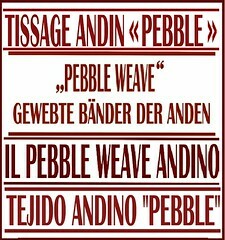 The GuaranÍ weavers, as far as I have seen, make no such (unnecessary) effort…they think like birds. Speaking of intermesh, let me show you Julia’s latest creation in progress in this structure…. Julia tells us that the design comes from a book entitled Japanese Design Motifs. Designs like these with horizontal and vertical lines are ideal for learning this structure and are the kinds of motifs that I have provided with the tutorial in my second book. I used Bhutanese and Mexican patterns for inspiration. The horizontal lines have “saw-tooth” edges and the verticals are crisp and smooth plus the cloth is double-faced! This trip is drawing to its close. I can look back over the last weeks of weaving with friends, new and old, from a bird’s eye and ant’s eye view and benefit greatly from both perspectives. The ant asks what details can be improved. 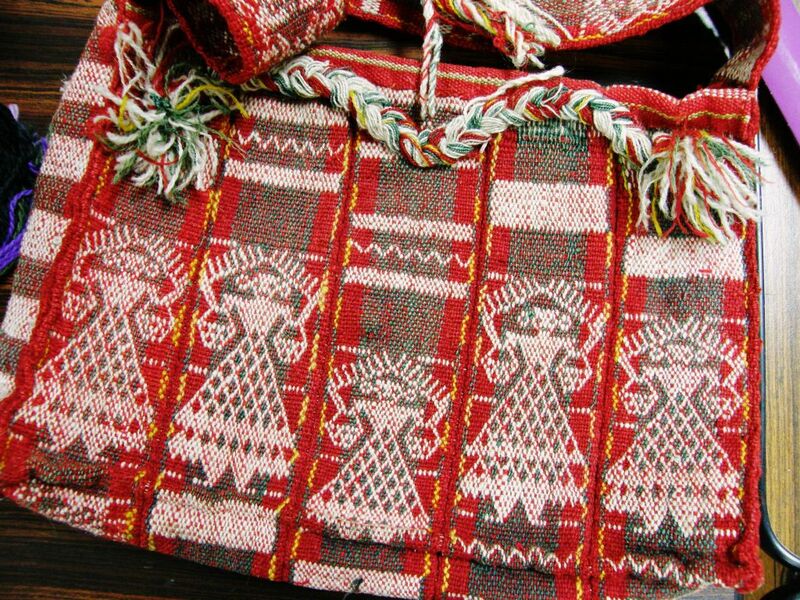 The bird hovers above to see patterns appearing on bands and cloth, the weavers’ reactions – their smiles and frowns and “aha” moments, changes in their energy levels and receptiveness which their body positions often reveal….and listens to the fluctuating levels of concentrated silence and relaxed chatter. Here’s a quick whiz through some of the days I spent weaving both east and west on this trip…. 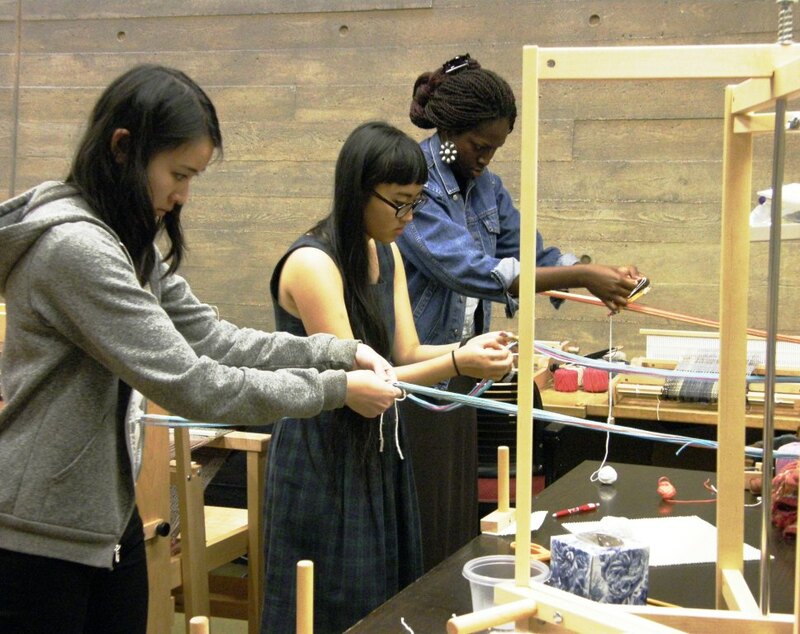 Backstrap weaving with ladies at Yale University…. They have a wonderful weaving room for free time weaving. 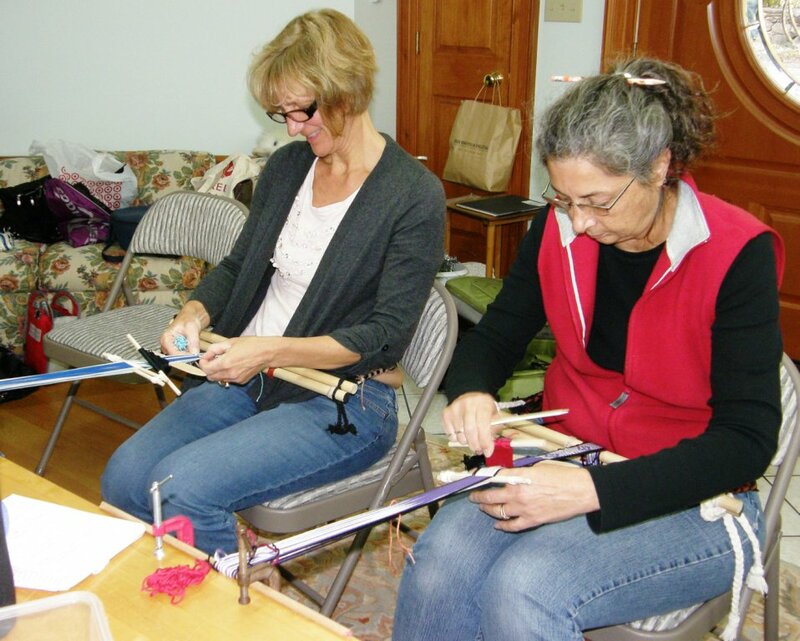 It is full of floor, table and rigid heddle looms which meant standing room only. Many thanks to Barbara who took me to visit with these ladies. Here they are finding the cross in their warps so that they can make simple heddles. Massachusetts turned on its fall colors for me as we drove home each evening after some weaving in the glow of the setting sun. 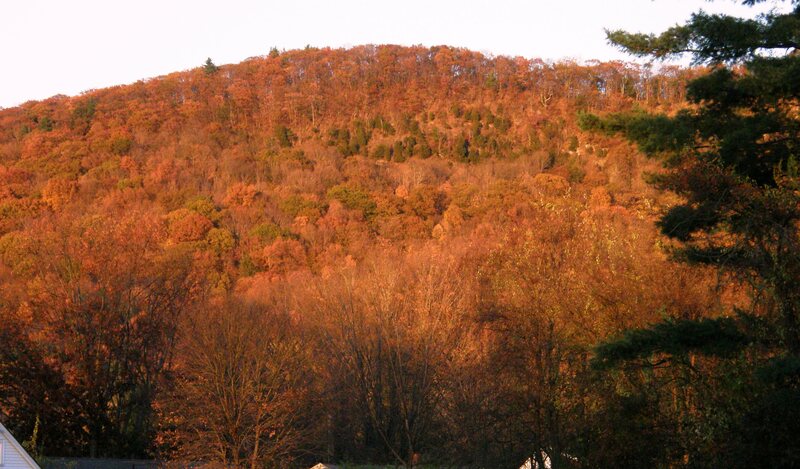 Here is a shot of what Lausanne in Vermont has dubbed “cinnamon hills”. And winter was definitely in the air with frosty mornings. Only the brave sat outside for lunch! I was one of them for about 5 minutes. 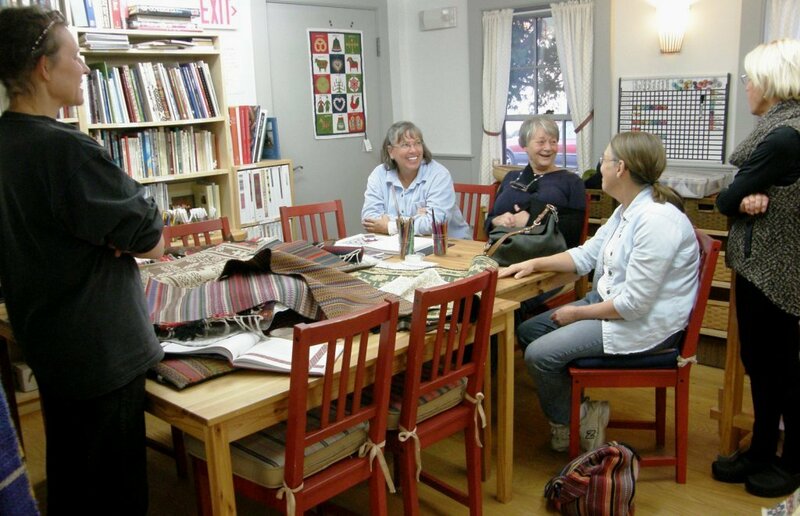 The round table was a perfect set-up among Liz’s natural yarns and fibers, locally made scarves and shawls and crafts. It was a sweet space in which to weave. RIght now Liz and her partner John are involved in the 500 Hats event which John came up with to celebrate the 75th anniversary of the Dr Seuss book. 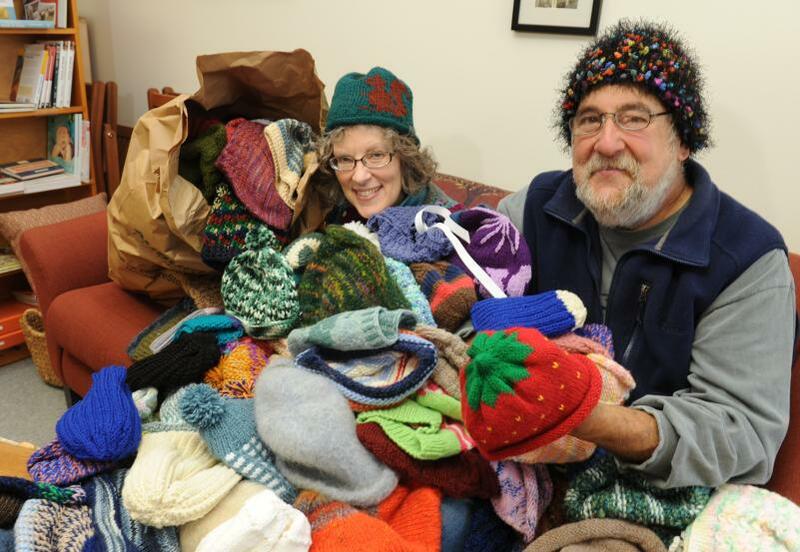 You can read more about the project here…there are over 1600 hats so far in their living room. Moving over to nearby Northampton….here are a couple of things that Chris worked on.. 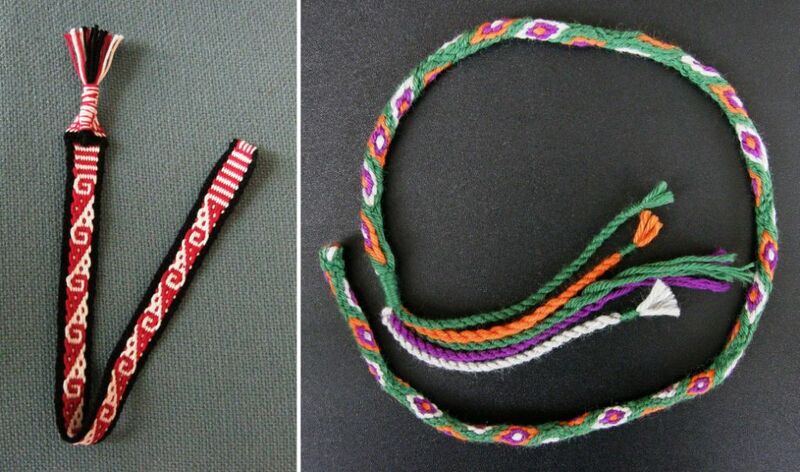 Here you can see her pick-up band finished and decorated with a triangular braid (which I now know how to do….yay!, thanks Chris) as well as her ñawi awapa piece on which she has just about finished twisting and binding the warp ends. 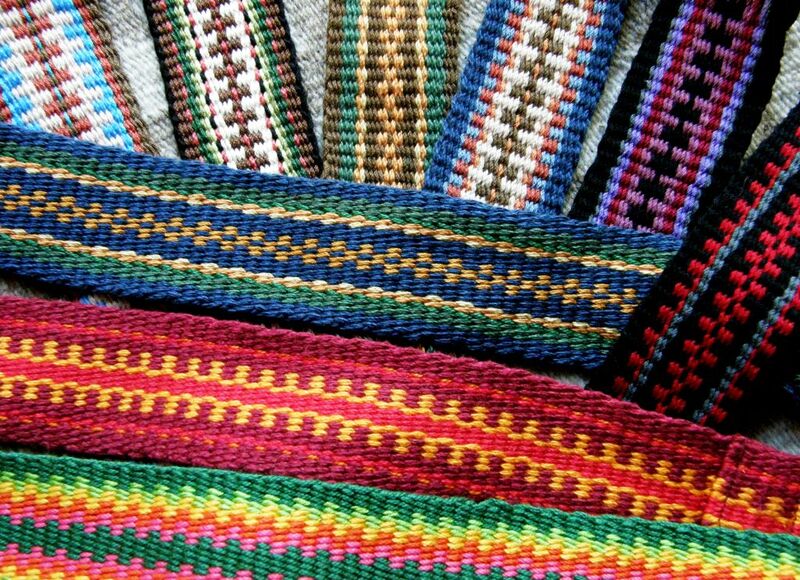 It was a second time weaving with these friends and we did some more pebble weave, made tubular bands and sewed them to pouches which we later dressed up with decorative stitching. 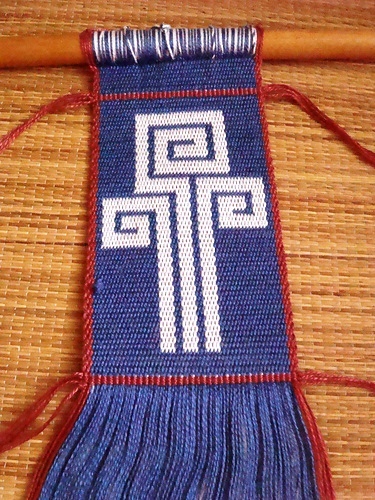 The mouth of a Bolivian woven pouch is decorated, after having been edged with a tubular band, with cross knit looping which is a sewn technique. 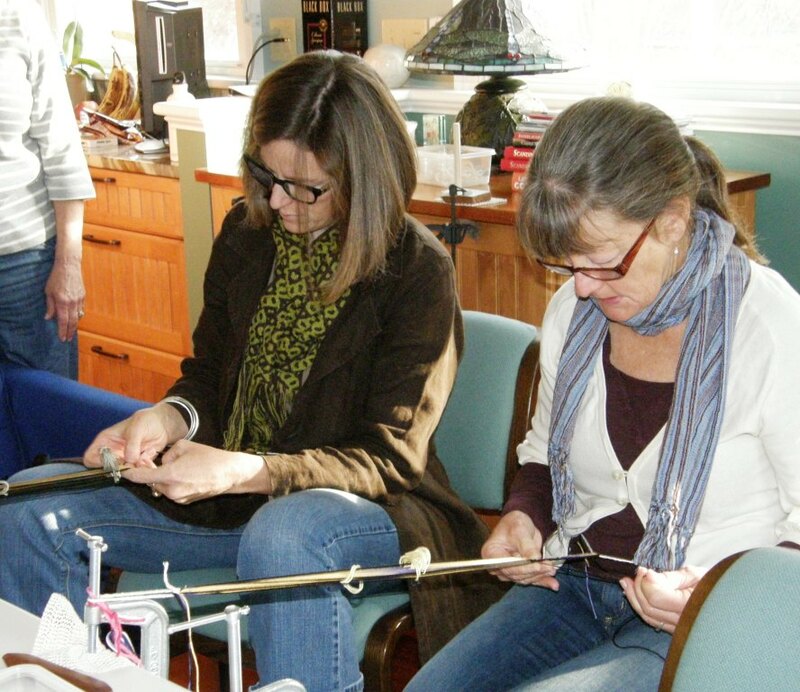 The hands above belong to Lisa, on the left, seen here weaving a complementary-warp band alongside Mary-Lou. Lisa is wearing one of her own gorgeous deflected double weave scarves. 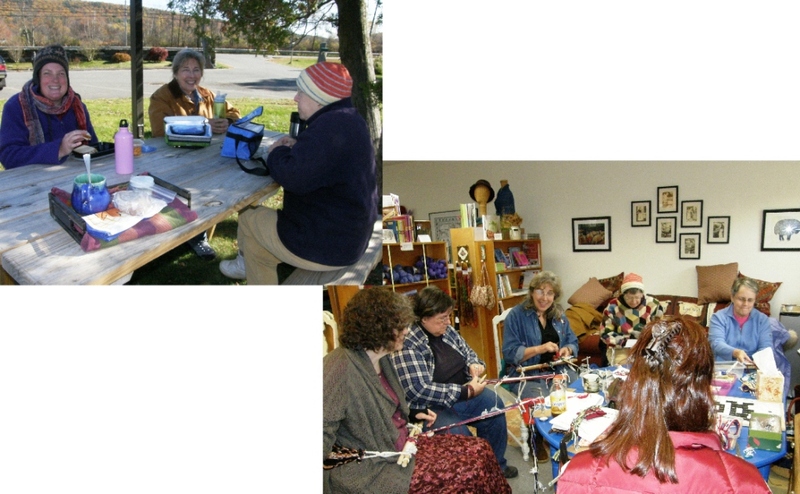 Barbara invited friends to her home in Connecticut and her fabulous weaving studio for another gathering where we all wove together…. 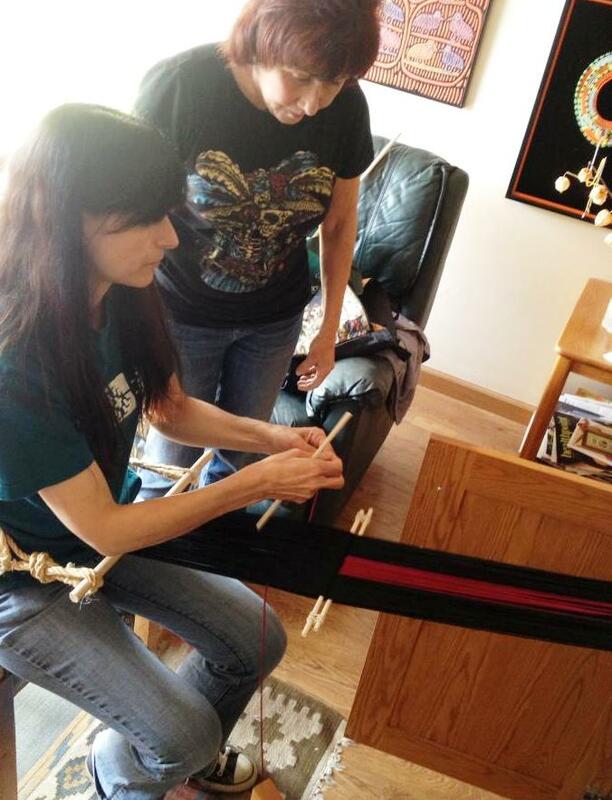 Claudia and Susan decorate a warp-faced band with both single and double-faced patterning techniques. And here in California yesterday, we gathered to practice setting up for wider projects. Some people in this group were weaving with me for their their third and fifth times while others were on their second time. 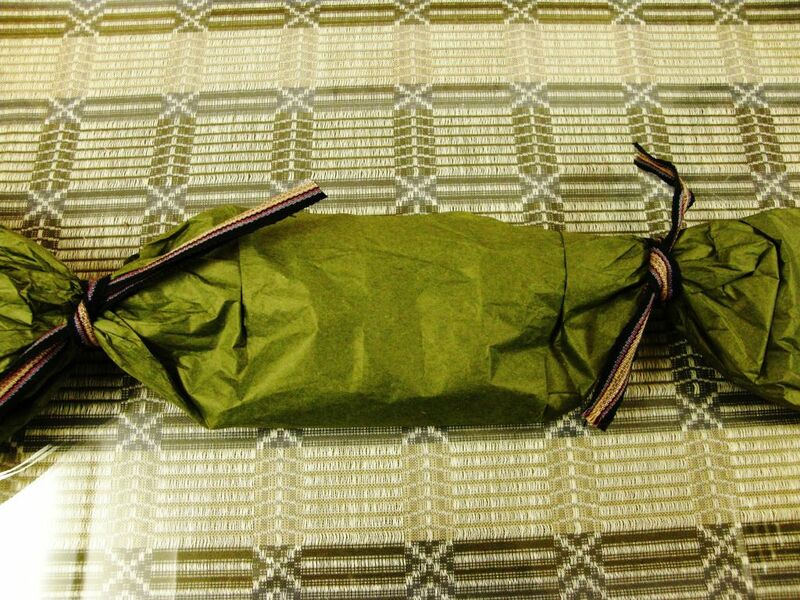 Cookie’s finished piece will be folded into a long narrow bag for a small backstrap loom that she was recently given. So, we had a group with a variety of experience levels. I think that “experience level” is often most evident in the kind of warp a weaver can create in terms of evenness of tension. Here is where the “short and narrow” mantra comes into play. 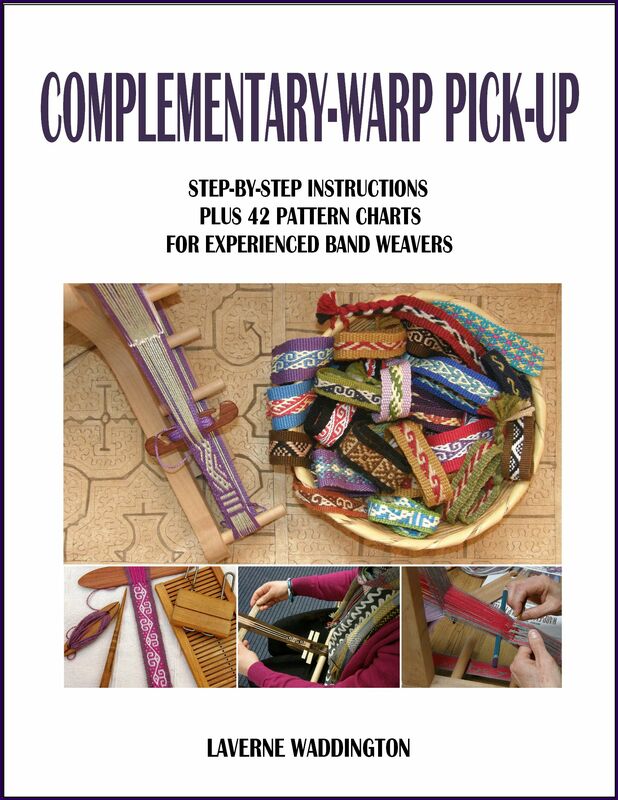 Perfect your warping techniques winding short and narrow warps over and over again! SHORT, because you will weave off your project quickly and get another valuable chance to warp again soon. NARROW, because there are different tips and tricks yet to be learned for creating successful wide warps once winding narrow ones with consistent tension has become natural. The idea was to go wider without necessarily going longer. 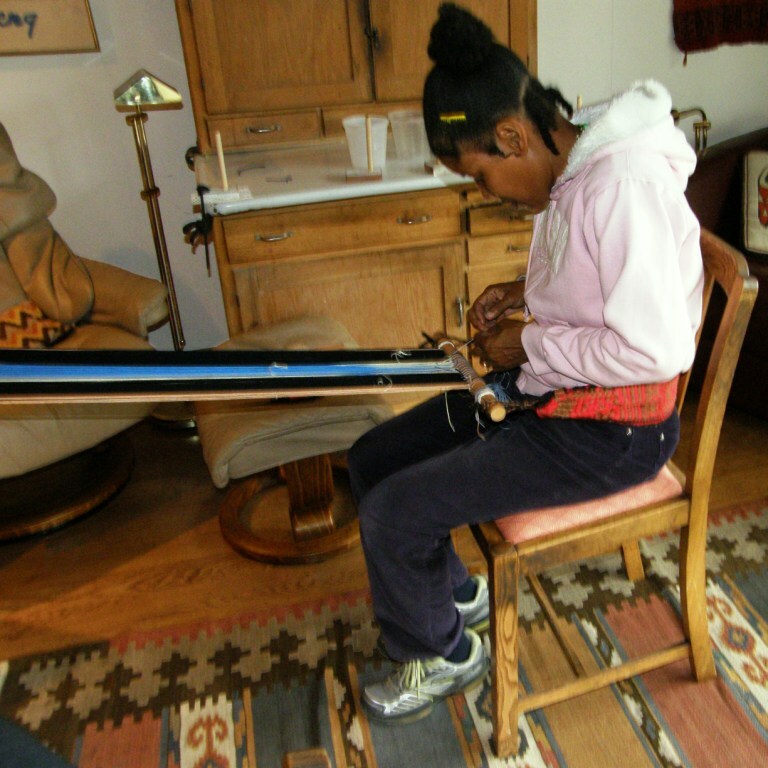 You can see Ruth’s pretty warp above made from Tahki Cotton Classic onto which she is putting her first set of string heddles. The strip of orange and purple down the middle will be used to create a pattern in the Andean Pebble Weave structure. She is going to weave the other plain parts using the “thick border” technique described in my first book. This will cause the plain parts to narrow and thicken to match the thickness of her pebble section. Therefore, her finished band will be a lot narrower than the warp appears in this picture. This might become her backstrap. We needed to refresh some things that are necessary for creating wider pieces, such as putting the string heddles on a stick instead of tying them in a little bunch. 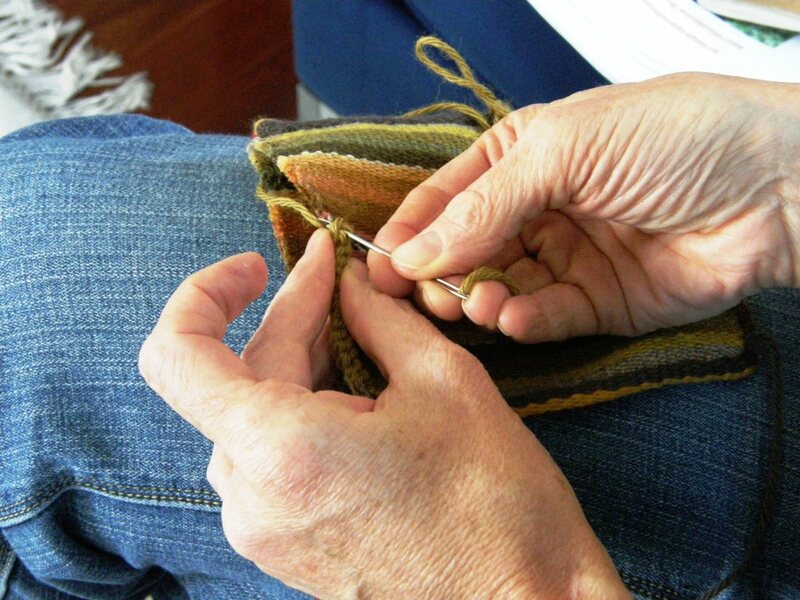 Kathy chose to make a backstrap using Plymouth Yarn Fantasy Naturale and a double- faced warp float pattern. 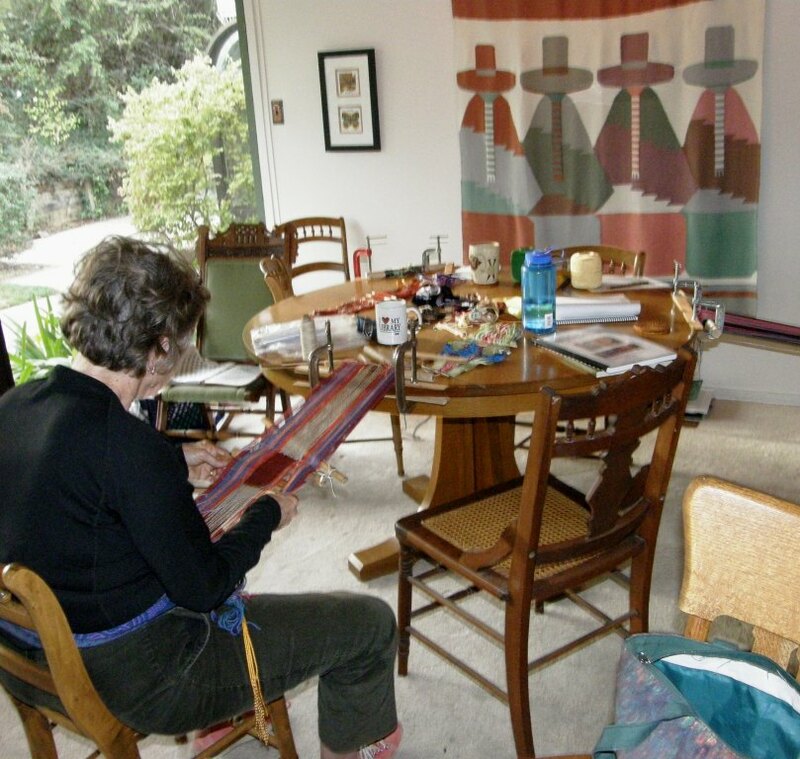 Kathleen chose to use overtwisted wool that she got in a class with Jacquetta Nisbet many years ago. She has already made a beautiful backsrap with this wool and knows how it behaves. She wants to make a small pouch with a pebble weave motif and wrote to me about how this warp feels “alive” after having used cotton for some time. As you can see we were in a soothing environment in Betsey’s home surrounded by textiles that she has collected in her travels. Dorothy’s project in Tahki cotton classic is so beautifully arranged. It will have three strips of pebble weave pattern and the color combination is so gorgeous! I am wondering when she will have time for it as she is off to the Tinkuy in Peru this Friday!! We are all so excited for her. Goodness knows what kinds of inspiration she will bring back with her. By the way, Dorothy’s loom is made by Terri at Magical Moons. I hadn’t seen one of these before made by Terri. 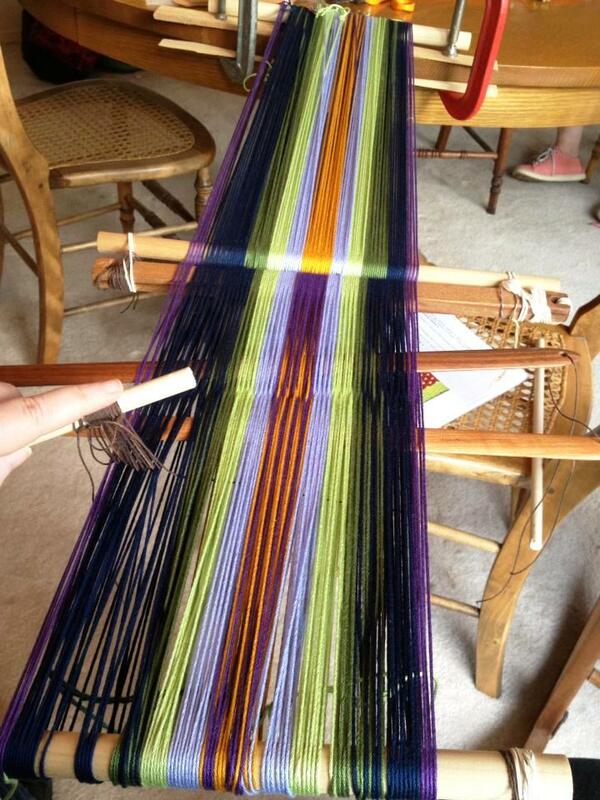 The loom bars are silky smooth….beautiful work!! Betsey’s project was the narrowest but with by far the finest thread and I neglected to photograph it, unfortunately. She warped for a pebble weave pattern using the thick borders and her piece will do nicely as a cellphone pouch. 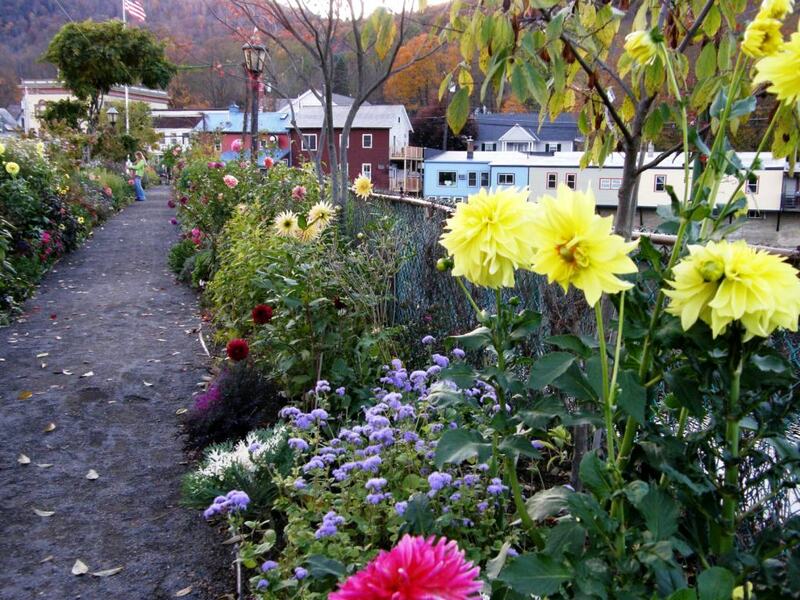 Somewhere in-between all that, Barbara took me to Shelburne Falls Ma to visit Vavstuga Weaving School. That’s a name that constantly comes up in the weaving groups on Ravelry and I was excited to finally be able to see it and meet the staff. I was surprised to find Cindy, one of my backstrap weaving friends, apprenticing there. What a beautiful location right next to the Bridge of Flowers which even at this late time of year is full of color against its backdrop of cinnamon hills. Color inspiration anyone? 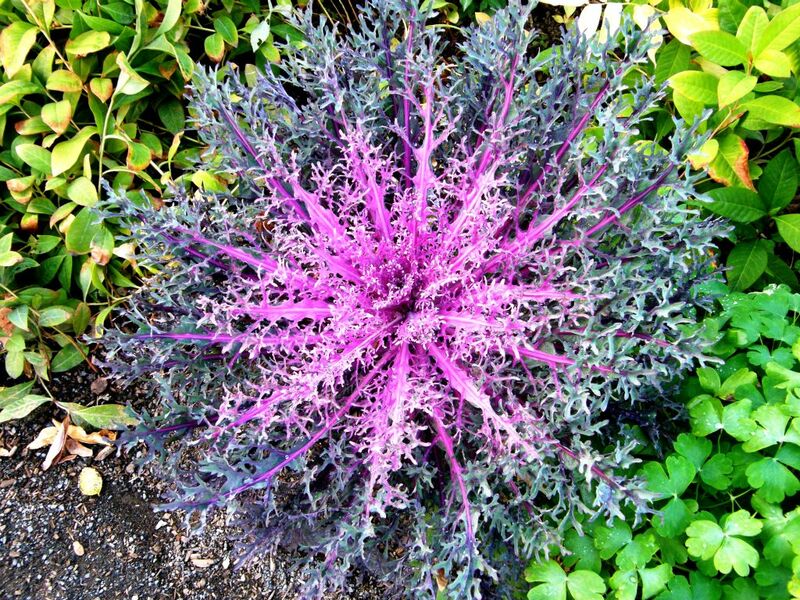 This was in the bridge garden…never seen anything like it! Becky Ashenden along with her newest apprentice and other Vavstuga staff showed me around. As we chatted at the table, Becky pulled out one gorgeous textile after another to spread on the table. Not that I know much about Scandinavian weaving, but the textiles were everything I expected and more…rep weave, white on white, linen, crisp and clean, simple, classic, impeccable! Becky opened a door to a closet which housed hundreds of samples. More samples were draped over loom beams for further inspiration, instruction and guidance but, most importantly, gorgeous handwoven textiles were everywhere to be seen and touched and used in in the house and studio….not just sterile samples to be taken out and studied and then put away. They added warmth and comfort and a lovely sense of home and familiarity. This must be a lovely place in which to learn to weave! This hanging adorned the wall of Vavstuga student dining room which overlooks the river. 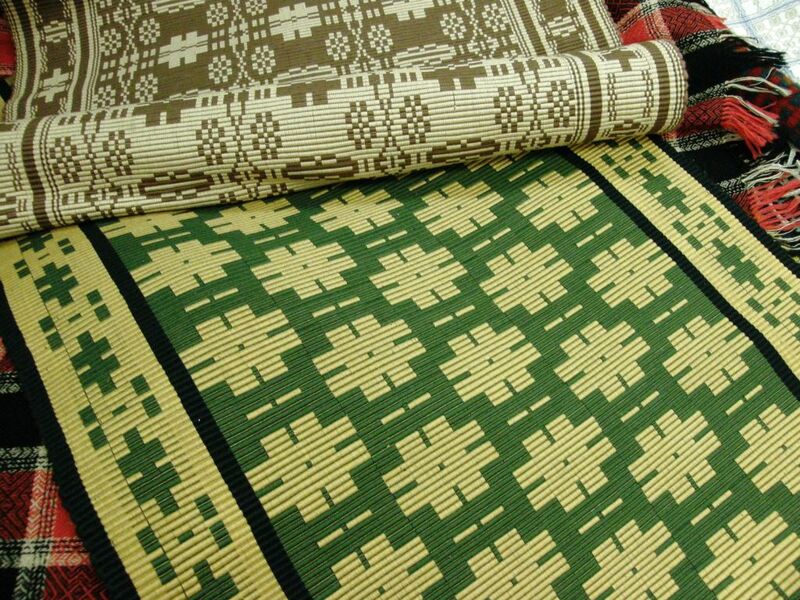 I had heard it all before in the online groups…everything at Vavstuga is handwoven. It was wonderful to see it all…. from curtains to hand towels and floor coverings and hangings. Becky wove that backstrap. Isn’t it gorgeous? She wove one end of the waist band as a tubular band in order to more easily hook on the clever wooden device that holds the warp . 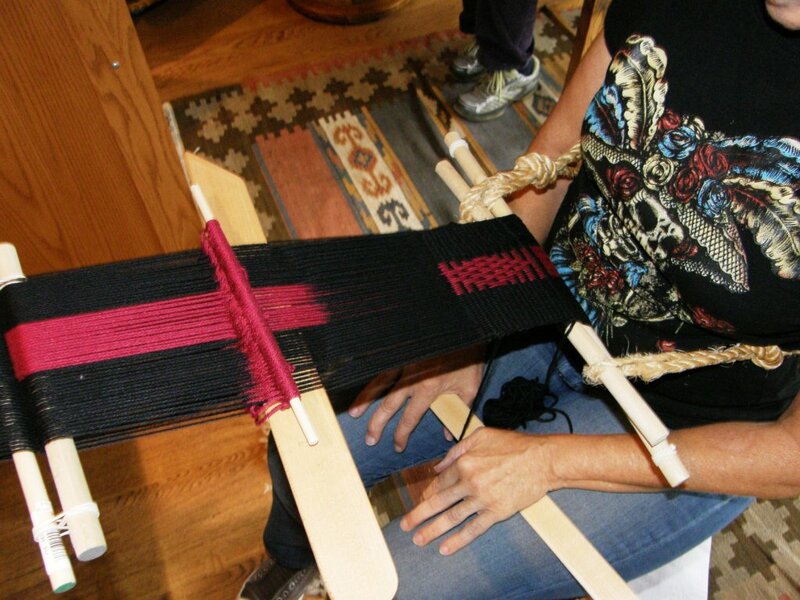 Look at that sweet rigid heddle and there is also a lovely wooden smooth shaped sword that completes the set-up. I guess that I just couldn’t hide the smile and delight I felt at seeing all this as, when Barbara and I were about to leave, I was given this mystery package…. No prizes for guessing what was inside!! Some of the other textiles I met along the way…. Many thanks to Ruth who brought this along to share with me. 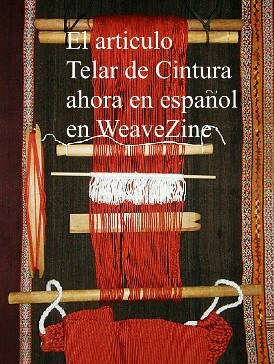 It is warp-faced double weave cloth, although in many places the warps are quite spread and reveal the weft. A band has been cut into strips and sewn to make this bag. We don’t know its origin but I really appreciated the opportunity to look at it. 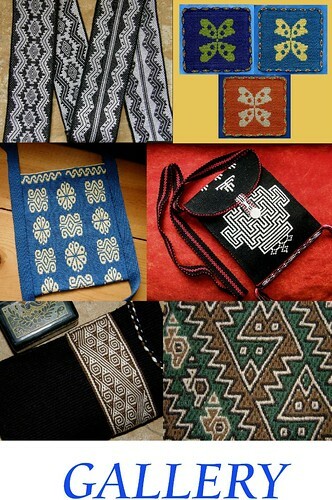 And here is a bag from Tibet, owned by Ute, that was made by sewing pieces of a tablet-woven belt together….fabulous motifs for intermesh. And here I am today in the home of inkle weaver, guitar strap and sash maker Annie. 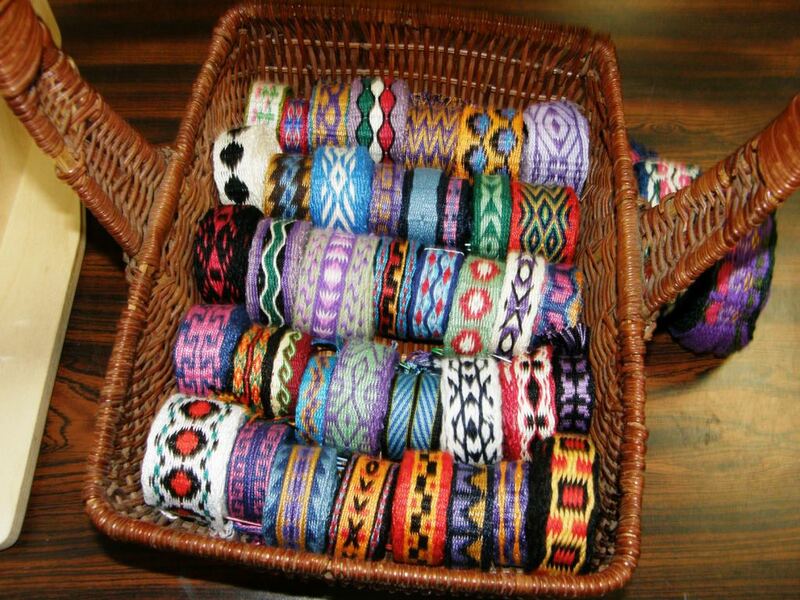 While she is at work I get to rummage through baskets of her colorful bands and sashes and samples….no two alike, so every visit brings forth something new! Thank you to Kathleen who took me down to ground level to be an ant last weekend. Kathleen is a marine biologist and took me to the beach to go tide pooling…super fun!…While swathes of slumbering and interesting seaweed waited out lowtide above water, we peered into pools and found whole worlds of life and variety and movement and color and cleverness within. I had remarked to Kathleen earlier that day that the vertical pieces of rebar sticking out of the top of the wall would make great warping stakes. It was too bad that they were soon to disappear within another row of blocks. I then told her about the woman in Peru who had warping stakes embedded in the wall of the hall of her house. She would stroll up and down the length of her hall creating her warps. And so, an idea was born. Those metal pieces of pipe will be locked into place when concrete is poured into the blocks. 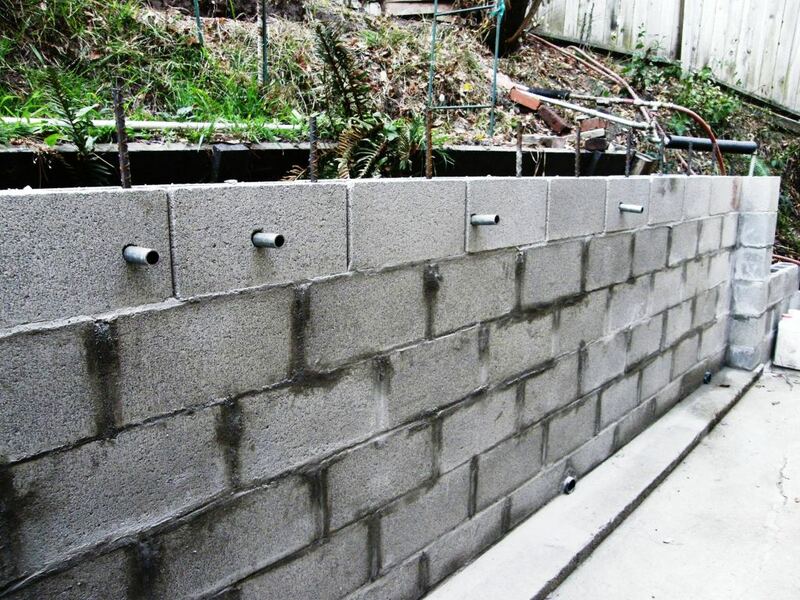 Then, dowel rods will be placed within the pipes…..a wall warping board. I am jealous! Next will come hooks in the wall to which Kathleen can attach her backstrap. 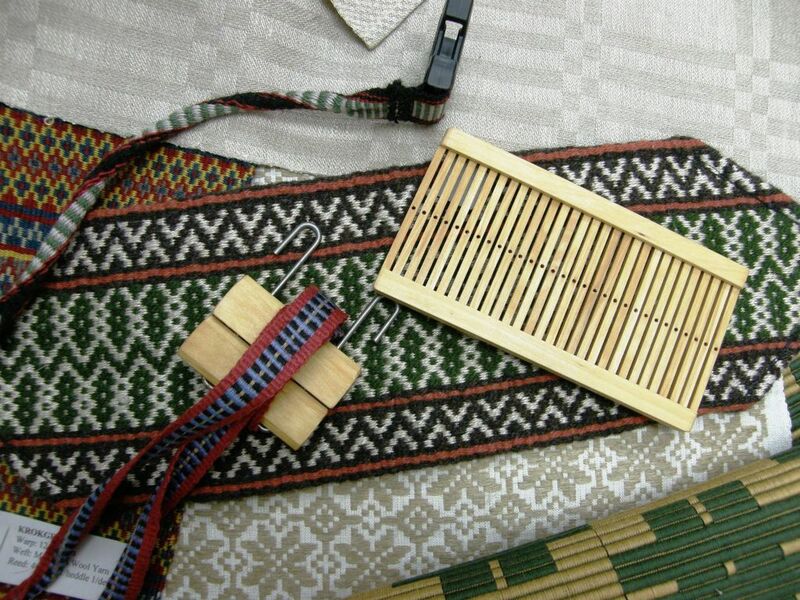 Warm, sunny days outdoors weaving….lovely! Tinkuy is next week!!! I am not going… what will keep me from pining is the fact that I will be over the ocean thinking like a bird on my way to Australia on the14th. My weaving friends Dorothy and Karen are going. 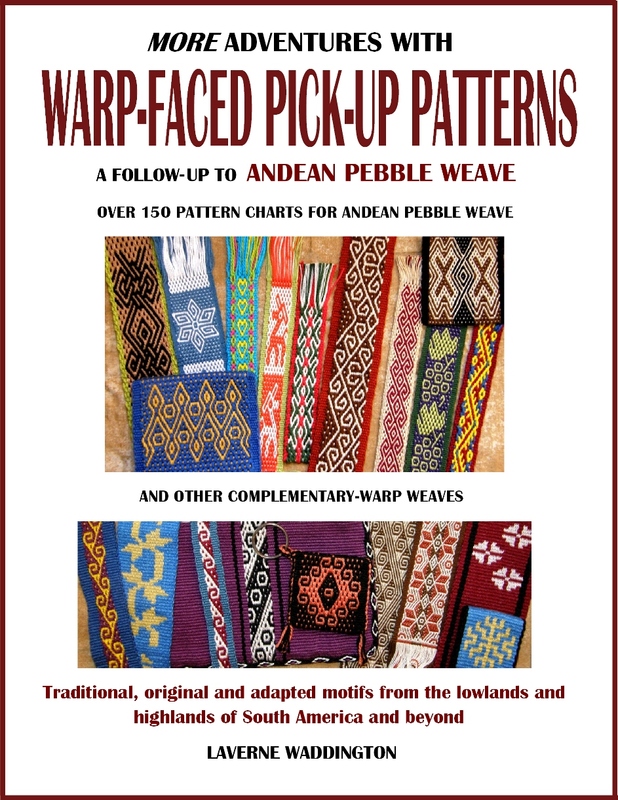 A few of my Argentinian Facebook friends will be there and Jennifer Moore, with whom I backstrap wove in Santa Fe this year, will be going to teach the Peruvian weavers balanced double-weave pick-up. Jennifer wrote to me this morning to tell me that we will be roomies at CNCH next year. There will be some stories to tell!! I hope that if you go, you will send me stories, reports and pictures that I could share on this blog or links to your own sites that I can include here. Have a wonderful time all of you!!! Dorinda from PAZA Bolivia (no link as the website is temporarily unavailable.) and my weaving teacher, Maxima, will be going again. Last I heard, Dorinda was also going to take one of the teenagers. Dorinda met her funding needs with many generous donations from a variety of sources. Look out for Dorinda and Maxima there. I wonder if Maxima will outspin the Peruvian ladies in the speed spinning competitions again this time! Making a documentary with the weavers of Huancarani became reality last April after over a year of talking about the possibility. Thanks to Sustainable Bolivia’s artist in residence Jasmine Pitt, most of the footage was shot in Huancarani in a day. Jasmine directed, filmed, and edited the documentary. 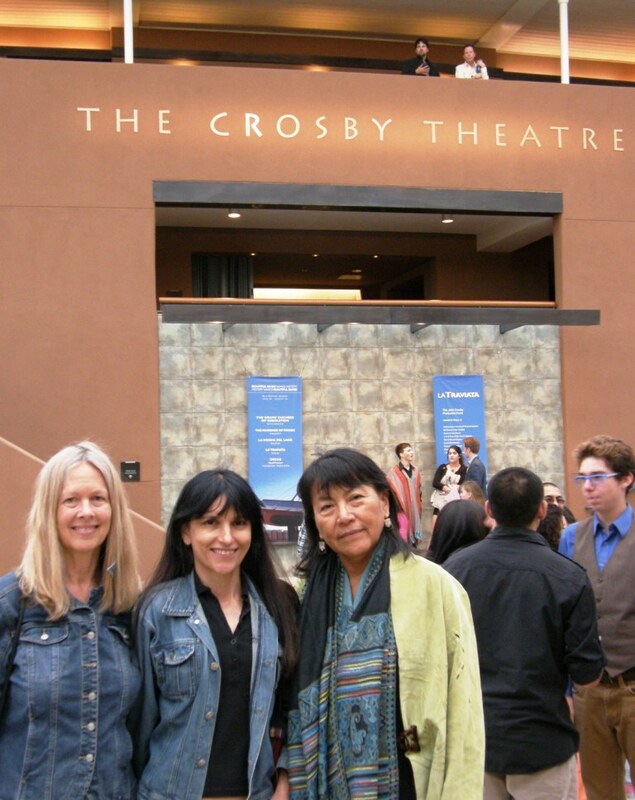 The women were ready with their thoughts, comments, and stories about the past, present, and future of their millennium long weaving tradition. More interviews were held in Independencia and Jasmine and Dorinda walked miles so Jasmine could capture the breathtaking landscape on film. The musical group Sacambaya generously granted permission for use of their music. It was a collective volunteer effort. Through Jasmine’s lens you will gain insight into the personalities and lives of the weavers and their concerns for the future of their weaving tradition. ENJOY THE VIDEO! and see you next time! 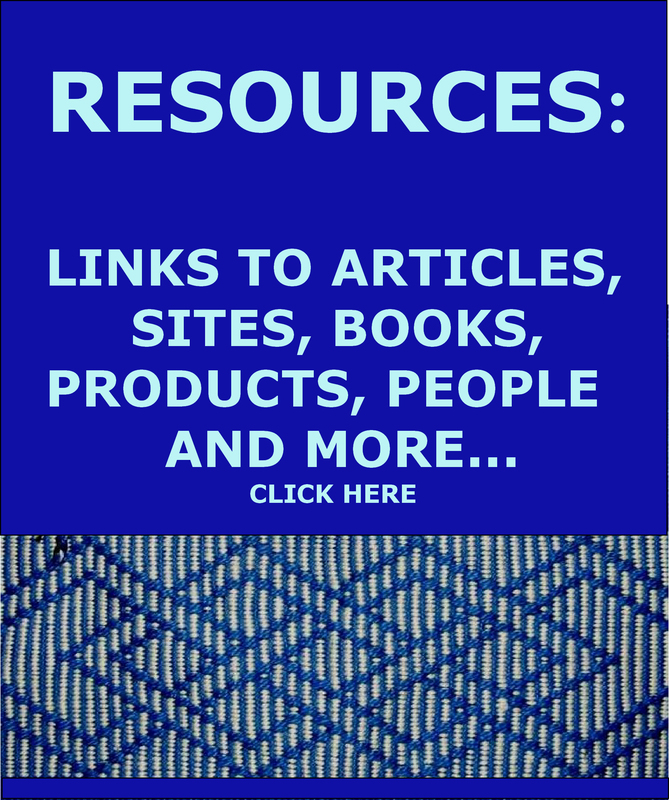 « Backstrap Weaving – Vermont!! Your post arrived as I am about to “fly like a bird” to Tinkuy and am anticipating every workshop and event. 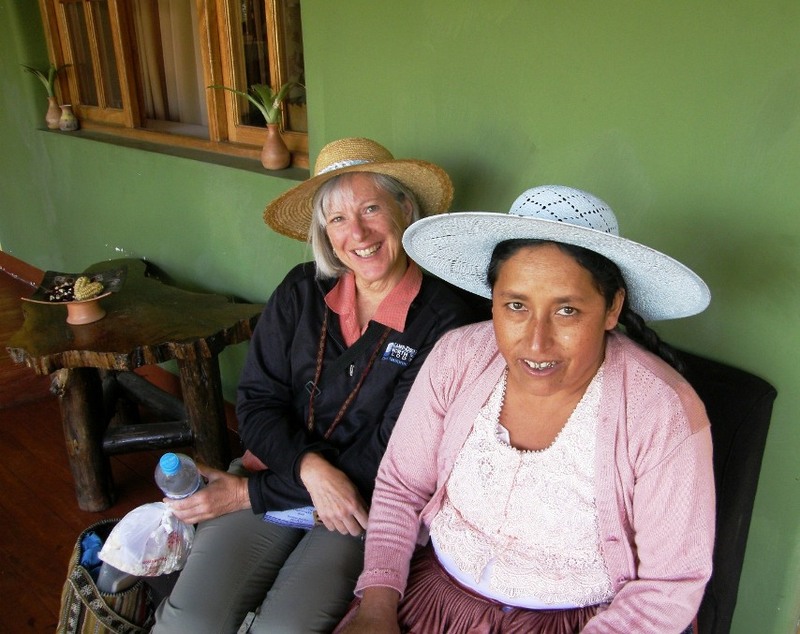 Prior to Tinkuy I was able to arrange day trips with the assistance of Nilda Callanaupa Alvarez to several of the communities supported by the CTTC….. Chinchero, Pitumarca and Chahuaytire … to visit with the weavers and experience many techniques. Thanks for sharing your previous experiences at Tinkuy which inspired me to make this trip now a reality for me. Enjoy your time in Australia! Some traditions should never die. This is one of them. Beautiful!! Thanks for sharing. A lovely post, and thankyou for the wonderful video! Hola, Laverne! Gracias por compartir tus últimas experiencias y ese video tan hermoso. Disfruto muchísimo!!! So much beautiful inspiration in this post! Makes me want to hurry up the project on my loom and start something new. I love the ladies in the video modelling their amazing woven bags. So sweet. 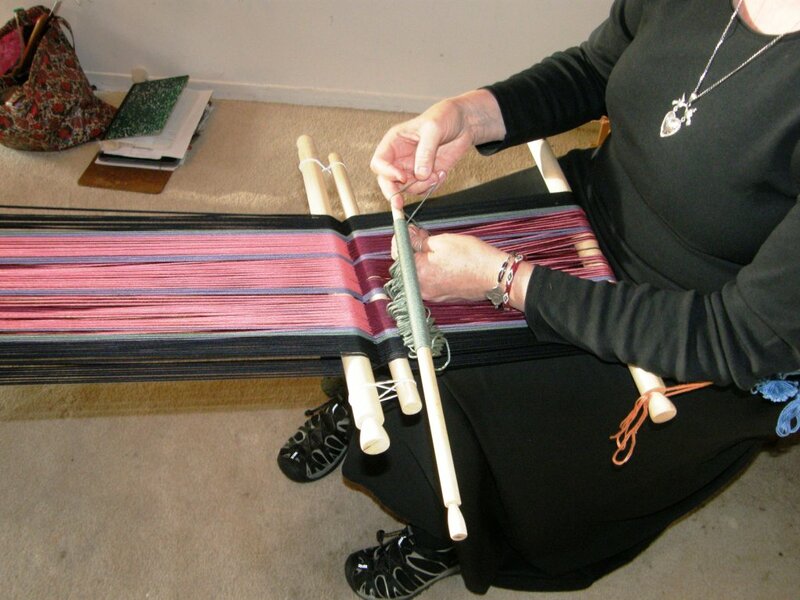 Thank you, Laverne, for continuing to keep the weaving inspiration coming. I really appreciate the views from the bird and from the ant. Really enjoyed the video. Thanks for sharing it with us Laverne!